Looks Good from the Back: Knoxville Bound. M: I think his bag is packed to come visit meeeeee! A: I'm guessing he doesn't have to sleep in the dog house with the ticks? M: Um, duh. For my husband's sake, I will make him a cushy pallet at the foot of the bed (this is a lie). A: Wait, is the pallet for your husband or Alexander Skarsgard? M: ANYWAY, doesn't he have the nicest arms? A: Oh, he has nice everything. M: I am now just staring at his picture and have nothing to say. A: I like that his bag is Mulberry. 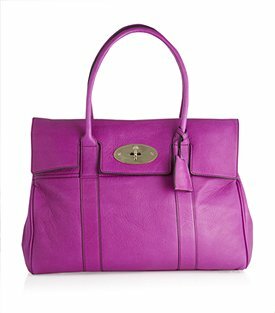 I like a man who likes Mulberry. And t-shirts. And stuff. M: My husband thinks Mulberry is a bush that a monkey chases a weasel around. And oops, it's NOT PIE. M: Well, it's the COLOR of pie? A: YES. This is what's known as Fashion Baking. M: We studied at the Sorbonne! A: I do enjoy whipping up a fluffy pair of pumps. M: Just the other day I was kneading my cashmere and letting it rise. A: Perhaps I could bake you up a Birkin? A: Oh my god, that sounds delicious. Perhaps Alexander will serve it to us? A: Can this happen now? Like, right now? M: I think you need to come to Knoxville. I am just saying. A: I AM. TODAY. OMG. M: We lost it a little. Ha. A: A little. It definitely explains why we need to be together. M: Like, committed to the same ward? A: Oooh, do you think they'd let us? We could do each other's hair! M: And paint our nails! Do they allow that? A: Yay! It will be so much fu...wait. M: There is Internet there, right? RIGHT? A: I don't think so. I'm leaving now. See you in seven hours! I love y'alls crazy commentary. This man needs to be in my life ASAP. I will cook him whatever he wants... like a PB and nutella sandwich. Quickest way to a man's heart.